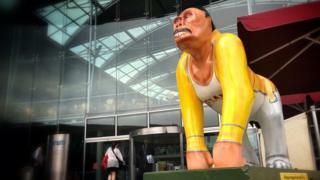 A gorilla sculpture, painted as musician Freddie Mercury, has been removed after a copyright complaint. Organisers of Go Go Gorillas, a public art trail in Norwich, were contacted by Queen's manager Jim Beach on behalf of the Freddie Mercury estate. The estate claimed the suit "worn" by the gorilla breached copyright. It asked the Freddie "Radio Go Go" Gorilla sculpture, which Norfolk artist Mik Richardson took three days to create, to be "taken off the streets". Mr Richardson, 50, of Aylsham, Norfolk, said the decision to order its removal was "absolutely shocking". He said: "It's dreadful. It's petty, really. The night I was told I couldn't sleep." Mr Richardson was paid £800 to design and paint the gorilla. "I'm a mural artist and I have to be very careful about copyright," he said. "I didn't copy the suit exactly. I alter enough so that it's fan art, rather than a copy of it. The "Radio Go Go" gorilla is one of 53 life-size gorillas decorated by Norfolk artists and displayed on the streets of Norwich over the summer. "They just said that they own the copyright on the suit and asked us to change it," Mr Langhorne said. "That's being sorted. To save any bother we will change it. "We do quite a few bits and pieces for them but it's no great shakes. "We would rather not have to do it but it's not the end of the world." He said the gorilla would be repainted with a "new and exciting design" and should be back in place within 10 days. "People in Norwich will have a new gorilla to enjoy soon," he said. Martin Green of Break, one of two charities that will benefit from the auction of the gorillas once the exhibition is over, said: "It's a disappointing position they have put us in. "Freddie is one of our most popular gorillas on the trail and now we've got to remove him from the streets. "It's a sad story, but the positive news is that we'll end up with another gorilla on the streets." A "Freddie Lion" had previously been commissioned for a Pride of Cape Town art trail in May. A spokesman for the Freddie Mercury estate said it would "not be making any comment".